Quick overview Claude Cahun is the most important artist you've never heard of - until now. Claude Cahun is the most important artist you've never heard of - until now. Writer, photographer, lesbian; revolutionary activist, surrealist, resistance fighter - Cahun witnessed the birth of the Paris avant-garde, lived through two World Wars and, as 'Der Soldat ohne Namen', risked death by inciting mutiny on Nazi-occupied Jersey. And yet, she's until recently been merely a peripheral figure in these world-shaping events, relegated by academics to the footnotes in the history of art, sexual politics and revolutionary movements of the last century. Now more so than ever, Cahun demands a significant presence in the history of surrealism and the avant-garde - even, in the literary canon of early twentieth-century literature. Indeed her one major book, Disavowals, is a masterpiece of anti-memoir writing. Much has been made of her as a photographer, but Claude Cahun 'the writer' was one of the most radical and prescient leftists of the century. 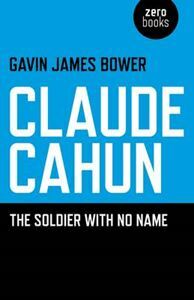 At a time when her star is rising like never before Claude Cahun: The Soldier With No Name represents the first explicit attempt in English to posit Cahun as an important figure in her own right, and to popularise one of the most prescient and influential artists of her generation.